Protocraft was established in 1994 as a company designed specifically to provide the O scale model railroad enthusiast with accurately scaled components to complete the otherwise fine O scale models available. With new O scale models being brought in every day, hundreds of fine O scale models that were made in both Japan and Korea years ago, and now in China, are to be found readily available at both trade shows and over the internet, there exists a wide range of opportunities and needs for the modeler who desires and appreciates an accurately scaled model. 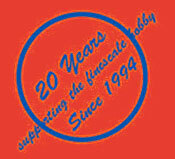 Achieving this goal is now possible with the many finescale components now available. Protocraft’s emphasis is on wheels, but it also provides trucks, diesel conversion kits, steam locomotive tires, the only finescale working coupler available, rail, and many of the tools necessary to accomplish various conversions from O Scale to Finescale, also known as Proto:48. Protocraft has sold over 28,000 Grabowski wheelsets and has over 200 different patterns in finescale dimensions. The principal aim behind Protocraft is always build everything at 1:48 from the prototype drawings, and not only will it look realistic, the parts will work and they will be interchangeable, just as much as parts work and be interchangeable in the real railroads. Protocraft’s most popular Bettendorf truck model has working brakes. Protocraft is not alone in developing and producing finescale components. It has patterns made by well known master craftsman such as Oscar Neubert III and Bill Clouser, tools designed by Paul Martineau, CAD drawings by Carl Jackson, diesel conversion patterns by Pat Mitchell, accurately scaled track components by John Pautz, wheel patterns by Jay Criswell, and many different wheels and stampings designed by Steve Grabowski. Many HO modelers have shifted to a larger scale in order to achieve a more detailed and realistic operating model because it’s much easier to detail, view, and has significantly better operating characteristics. O Scale is the natural choice for these modelers. Protocraft presents a further option - that of 1/4 inch finescale/Proto:48. Compare the O scale truck on the left with the scale dimensioned truck on the right. The absence of the back side of the journal box is indicative of the O gauge necessity to clear the thick wheels. The accurately scaled model truck on the right is more than just pleasing to the eye - as an accurate model itself it compliments and finishes the overall model. Protocraft’s mainstay of it’s business is the Grabowski wheel. Designed by Steve Grabowski from actual drawings of the prototype’s manufacturer, Standard Steel of Pennsylvania, then converted to CAD drawings by Carl Jackson, the Protocraft wheel is an exact model of the prototype. Produced on Brown & Sharpe lathes from mild steel (12L14), the production of the wheel is a two-part complicated process, requiring a second collet operation to machine the back side profile. This is a labor intensive process and is the only wheel on the market with full back side and accurate hub detail. 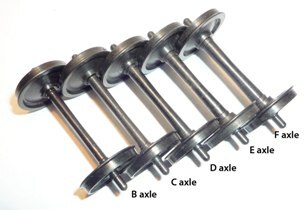 The axle, also produced from prototype drawings, is machined on a Swiss Screw Machine. 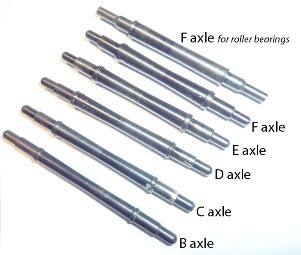 Each axle follows the correct hub and contour based on it’s tonnage rating, hence each axle installed in the respective ton-rated wheel matches the tonnage rating for the wheelset. (see table below). 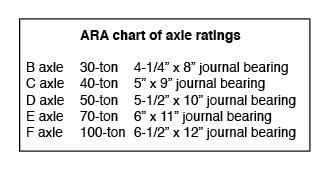 All prototype wheels are 5-1/2” wide, including the flange width. The flange has a height of 1 inch. All parts are made and assembled in the USA. 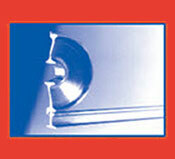 The Protocraft wheel profile is an accurate .115” width with 20:1 tread taper and correct fillet. The flange height however is made to .0258”. Running tire thickness also varies according to the prototype - from single-wear, two-wear and multi-wear. Single-wear wheels, when the tread has worn down to condemning limits, is discarded. Two-wear wheels, when worn to their condemning limits, were then shopped on large lathes and a new tread cut, then reinstalled for mainline use once again for one more use. Mult-wear wheels have the thickest tire portion of the wheel and can be re machined more than once until the final condemning limits are reached. Protocraft has modeled all three tire profiles on the appropriate wheels based on the prototype tonnage ratings. The parts are then heat-blackened with Pentrate to provide protection from corrosion and promote paint adherence, then coated with an oily wax for shipping and storage. The wheelsets are then assembled on a special press assembly jig to an accurate back to back measurement of 1.106”+/- .002” with a tolerance for spring-back of .001”. Protocraft provides wheel-pairs with insutators on both wheels or on only one side if electrical pick-up is required for either caboose and cabin cars or tenders. Each Protocraft truck kit comes with the appropriate wheelsets for the weight rating of the truck model. There is no finer nor better engineered model of the wheel anywhere than Protocraft’s Grabowski wheel.